Oscar Wilde said the best way to deal with craving was to yield to it. Some of us crave chocolate and yield constantly, however, there are others amongst us (stronger than me!) who can restrain themselves. We are surrounded by chocolate at Easter time, mostly in the shape of an egg. The Easter egg phenomenon has a mixed history, at one point in time, eating hen eggs was not allowed by church leaders in the week leading up to Easter, so they became something to paint, decorate and celebrate as holy. The Germans and French in the early 19th Century adopted the egg as a symbol of the resurrection of Jesus Christ on Easter Sunday. 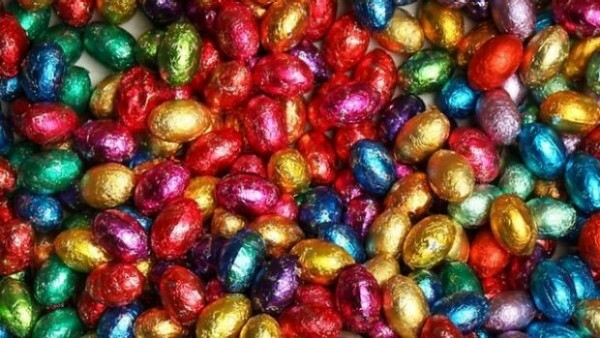 For whatever reason, the chocolate egg, (and for many of us chocolate in general) has become an almost compulsory part of Easter, but if like me, you’re not interested in the cheap second-rate, foil-wrapped chocolate rabbits and eggs, then read on. 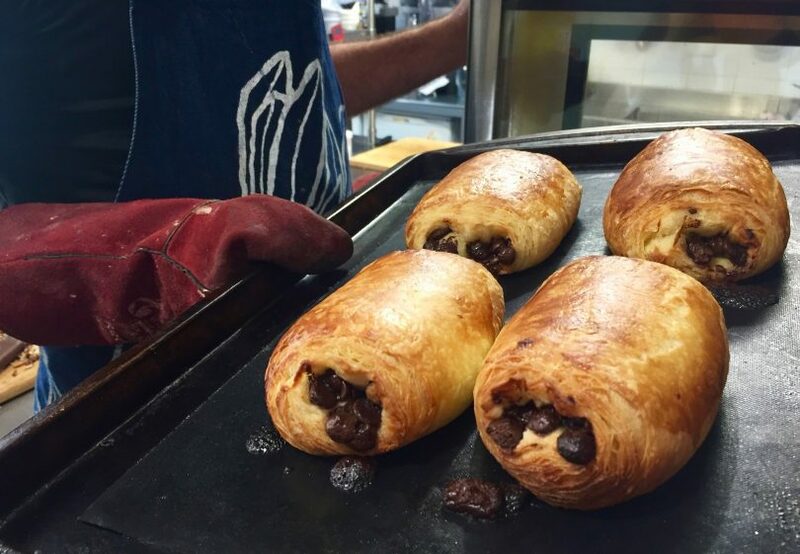 Chocolate croissants out of the oven at Tathra’s Blend. Photo: Lisa Herbert. Flaky pastry and dark chocolate accompanied by espresso coffee or a rich hot chocolate – is there anything wrong with this sentence? Every morning over Easter, Hassan at Blend will be baking this French delicacy, which to me is the ultimate chocolate breakfast repast. Blend Providore is also baking almond croissants, and their amazing blueberry and white chocolate croissant. Surely a run on the beach just across the road will assuage any guilt. 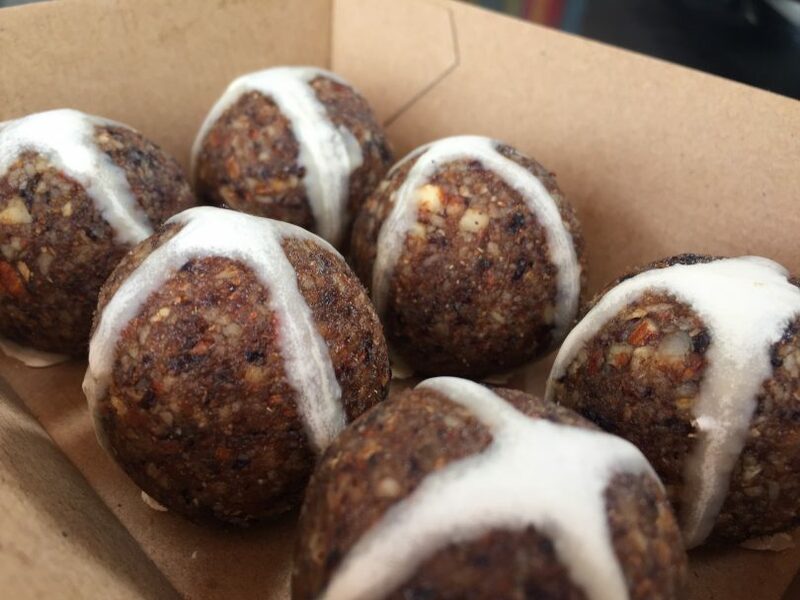 Faraway Farm has created a healthy vegan hot cross bliss ball. Photo: Lisa Herbert. These rich, cinnamon and health-laden balls, hand made by the lovely people of Faraway Farm (Hi Nicki and Chris!) will definitely satisfy an Easter sweet craving. Loaded with dates, nuts, and spices, they’ll be available at the Bega Markets and the Tanja Market Fair this Saturday (April 13). You could also pick up some of their kombucha which might help your tummy after a holiday weekend of over-indulging. 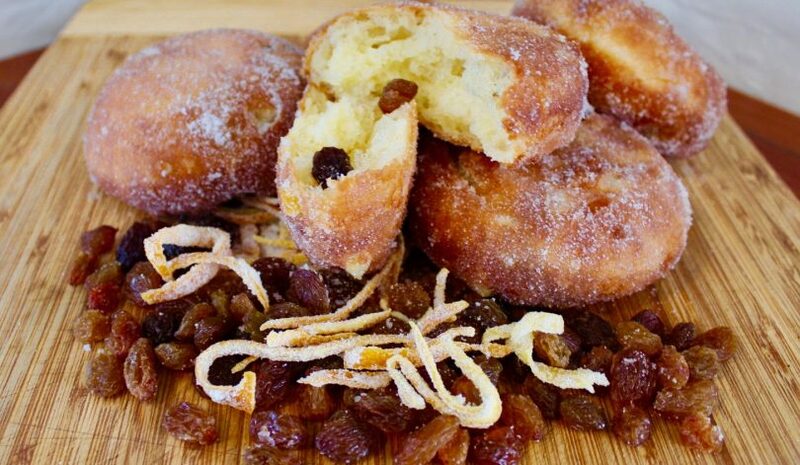 Real brioche donuts with easter flavours. Photo: Supplied. All the fruity, orangey, cinnamon flavours of Easter fruit buns, in a donut doused with confectioners sugar. Kelly and her team will also be filling some of their famous donuts with chocolate ganache as an Easter surprise. Over this period Eastwood’s coffee supplier ONA Coffee from Canberra has sent down a batch of their Easter espresso blend, a rich, dark coffee with chocolate notes. If you’d like to really get into the spirit of Easter baking, Eastwood’s highly reputable cooking school will be running an Easter Baking Class with Nelleke Gordon of River Cottage Australia fame. Book now for this one-off class on Thursday the 18th from 5 pm and learn to bake Hot Cross Buns and other Easter treats. Smother your chocolate pecan sourdough in ricotta and honey. Photo: Lisa Herbert. The wonderful bakers of Candelo’s Wheatley Lane Sourdough have crafted this special loaf for Easter, available at Bega Farmers Market on Fridays, and Merimbula Seaside Market on April 21. 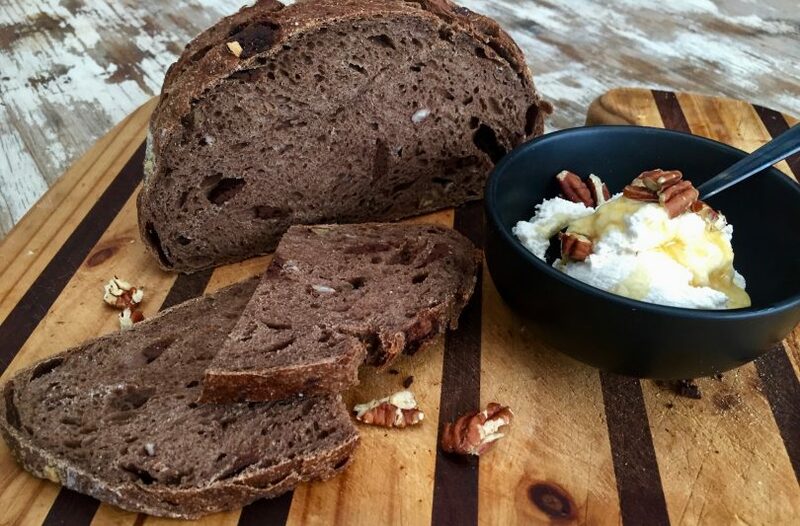 A beautiful rustic loaf spiced with cinnamon, and dotted with dark chocolate and pecans, this is sensational simply sliced fresh, or toasted and smothered with creamy ricotta and drizzled with honey. Or of course toasted and smothered with butter – bliss! Carob and vegan chocolate treats from Bega’s Candelo Bulk Wholefoods. Photo: Lisa Herbert. 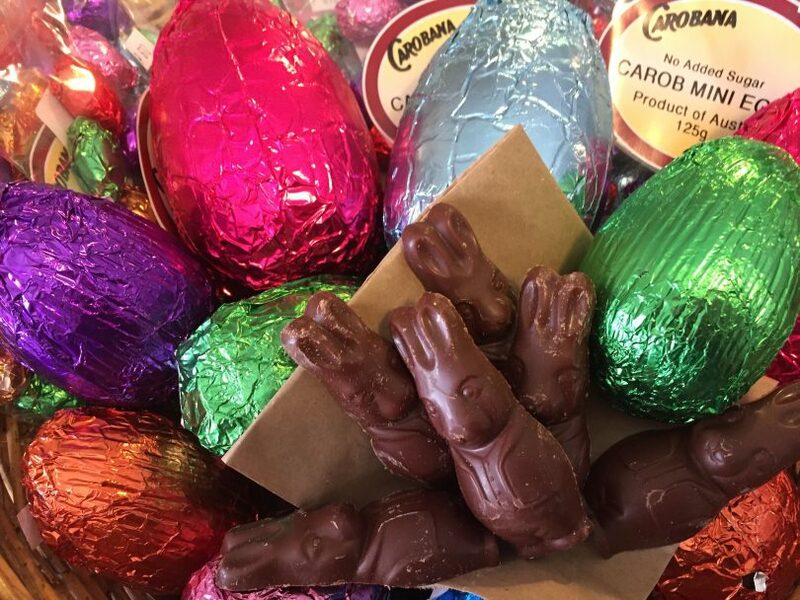 If you’d like to participate in a more mindful feast of chocolate goodness, the Candelo Bulk Wholefoods store has a plethora of eggs, rabbit, and goodies that have your body and planet in mind. There are beautiful carob eggs of all sizes, Spencer Cacao products, and incredibly delicious Vanuatuan Chocolate transformed in Mudgee. You can buy bulk chocolate for melting and turning into bark (recipe below) or your own baked or decorated Easter treats without worrying about the quality of the ingredients. There is also nuts, licorice or honeycomb enrobed in organic dark or milk chocolate to make up beautiful Easter packages for friends and family. Vegan delights aplenty at Gulaga Organics in Bermagui. Photo: Lisa Herbert. 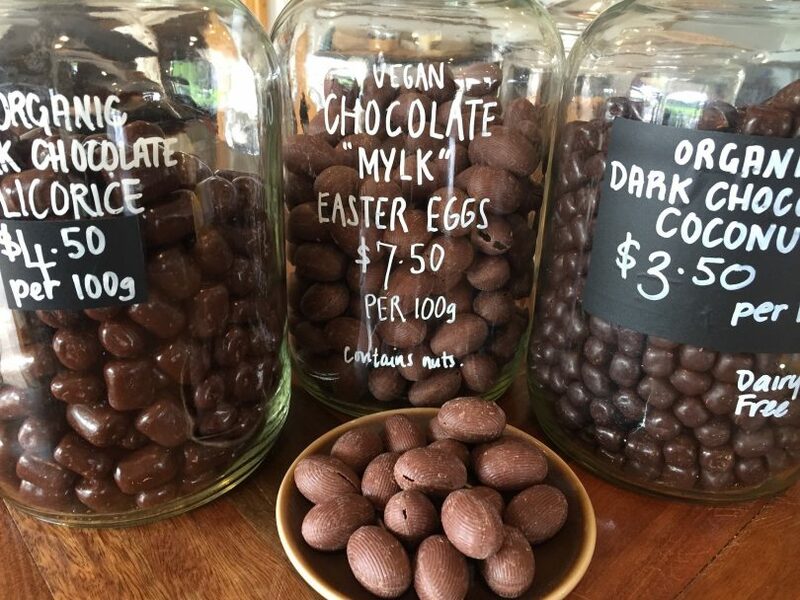 Gulaga Wholefoods in Bermagui has a wonderful selection of vegan chocolate eggs, dark chocolate covered coconut, and nuts, licorice and other treats. Buy in bulk and wrap up with ribbon for a gorgeous Easter gift for those you love and care about. Then, the morning after, you can atone with one of their healthy green smoothies. Shhh don’t tell anyone about these sensational strawberries from Pambula. Photo: Lisa Herbert. Now it’s time to reveal a secret I’ve been keeping for 2 years. In Lyndal’s lovely wholefoods shop in the heart of Pambula Village lies a jar full of magical goodies. 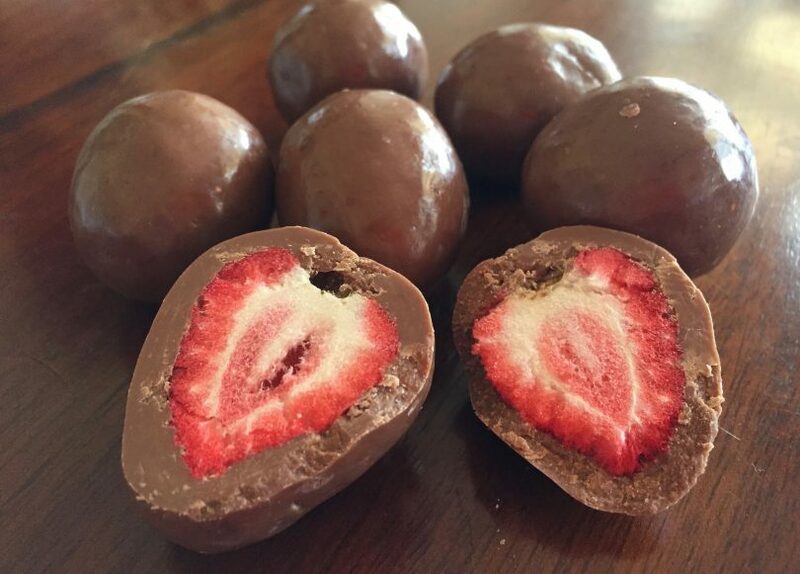 You will just have to trust me on this – organic freeze-dried strawberries in milk chocolate, doesn’t sound like a recipe for heavenly bliss, but it is! If you are a lover of the strawberry and chocolate pairing (and if you’re not, what is wrong with you?) you will absolutely adore these, they are organic and yes, you will thank me later! Another one to wrap up with a red bow for your darlings. Rich chocolate gelato with a view over the Merimbula Lake at the Boardwalk Cafe. Photo: Lisa Herbert. 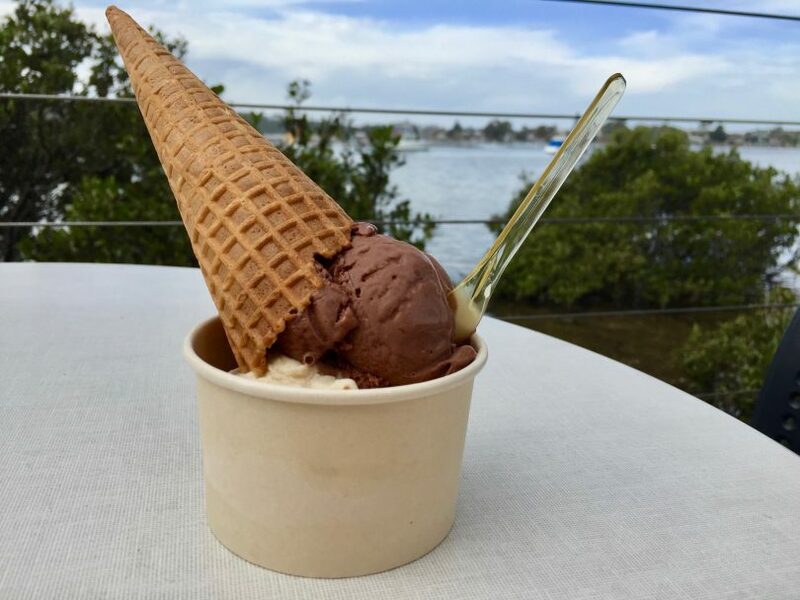 Bermagui Gelati Clinic, Merimbula Ice Creamery, and the Boardwalk Cafe in Merimbula are all serving chocolate icy creaminess in cones or cups, and the Merimbula Ice Creamery also has a selection of Nina’s Hand Made Chocolates which they can pop in a cute little box for you. 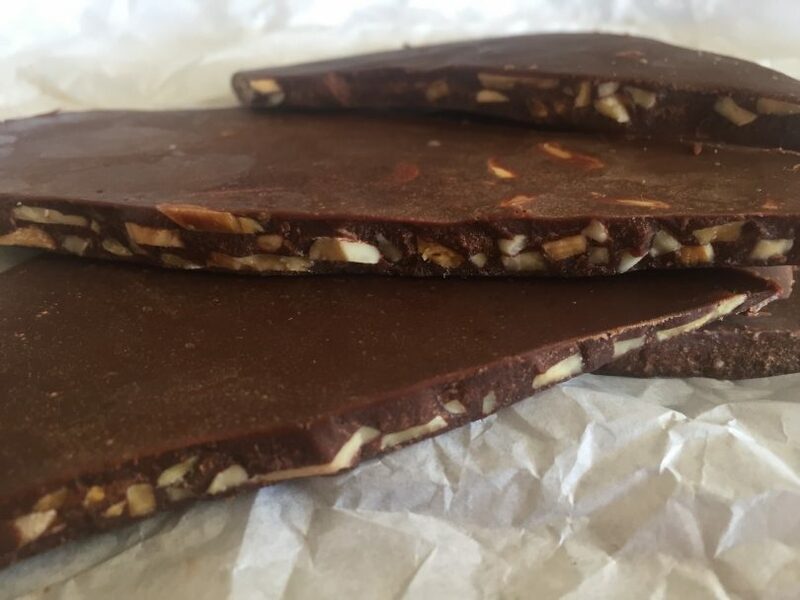 Make your own simple, healthy chocolate bark. Photo: Lisa Herbert. This is a very simple recipe, with few ingredients. Gently melt 200g of coconut oil or cocoa butter (or a mix of each) and stir in 50-60g of good raw cacoa or Dutch cocao, add 100g of your sweetener of choice, either brown rice syrup or honey, add a teaspoon of quality vanilla paste (not extract) and then a grind of sea salt. Mix well so the sweetener melts and infuses into the oil. Pour it all in as a thin layer on a baking tray (or 2) you’ve covered with baking paper, and put into the freezer for at least half an hour. I love coconut and chocolate so I stir in 2-3 tablespoons of desiccated coconut into the mix for a real ‘Golden Rough’ style bark. You can add anything you like – coconut, roasted almonds, cranberries, raw hazelnuts, why not experiment! Or you can grind lashings of sea salt over the still warm chocolate before it goes into the freezer. This will melt quite quickly when out of the freezer, so store in the fridge, or just eat it pronto! Delicious and elegant Tilba chocolates, get them before they disappear. Photo: Lisa Herbert. On a sad note, I have to report that after Easter, Tilba Chocolates will be changing the focus of their business away from chocolate, on to other things. 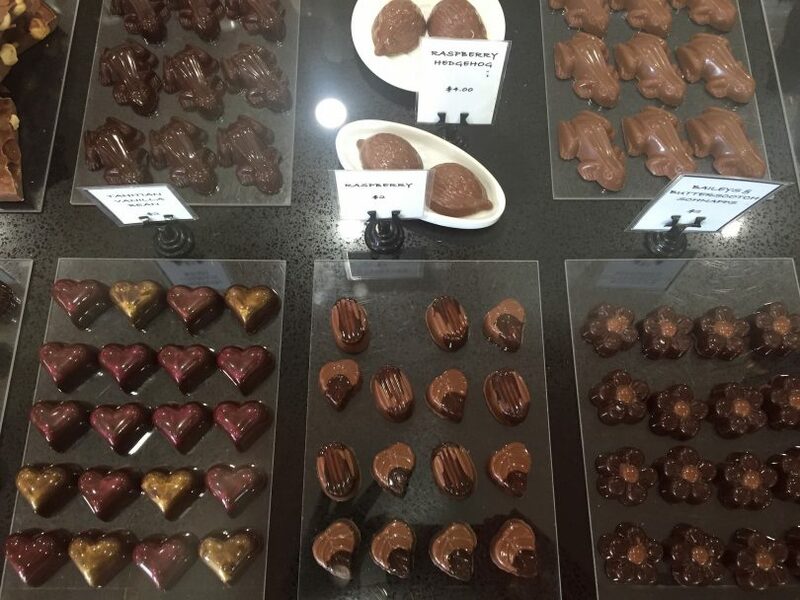 If you’d like to create a selection of very elegant hand-crafted chocolates as a gift for someone, visit them in Tilba now! They’ll be open for the Tilba Easter Festival. Editors note: Lisa Herbert dines at her own expense. Reviews are honest and not based on a commercial relationship. Love your work Lisa!